There have been countless articles about business cards and the first impression they can make. This isn’t a retread of that article. Rather we wanted to showcase a few of our clients who understand the importance of branding and allowed us rethink their identity starting with their business card. 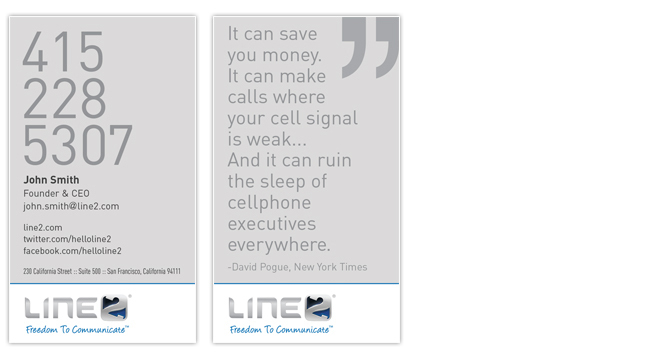 Line2 is a technology company cloud phone service app. It became obvious to us that the phone number made a statement about their business and the large type it became a conversation starter during meeting introductions. 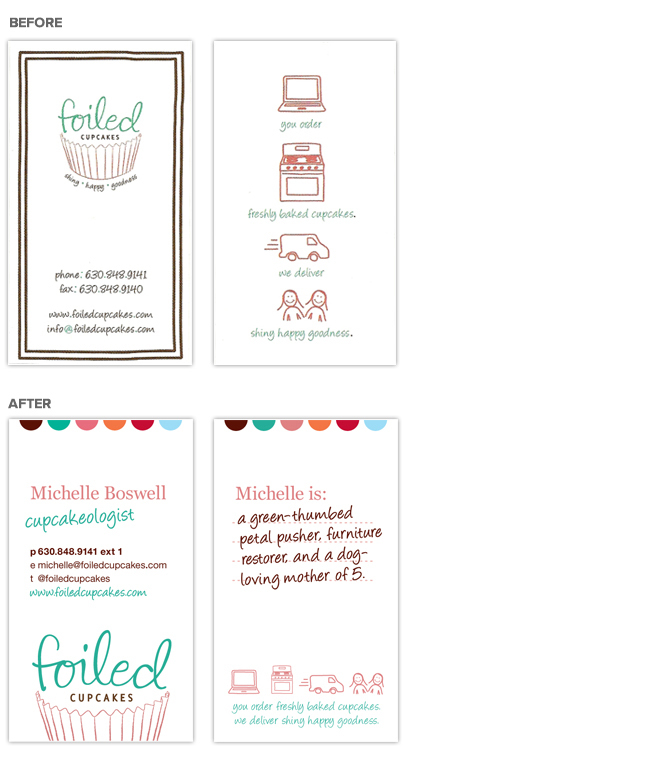 We had the opportunity to work with Foiled Cupcakes as their start up was rapidly expanding. Their original cards were a good start for their launch but as the company culture evolved they wanted their cards to reflect that same persona. We introduced a new color palette, created a hierarchy and made had each card reveal something interesting about the one carrying it. If you’ve driven past a construction site lately you’ve probably wouldn’t describe it as colorful or consumer friendly. 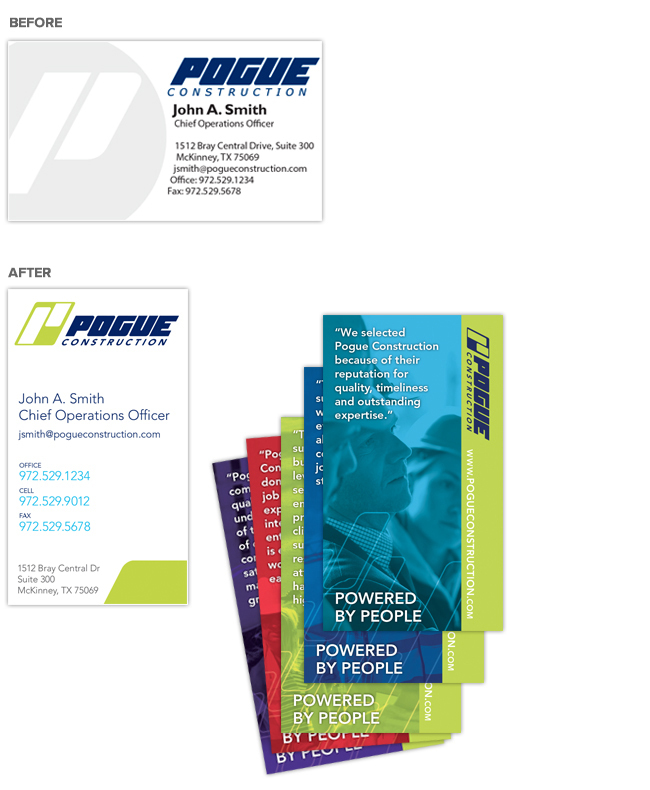 Pogue is challenging that idea with with fresh look that includes business cards showcasing the people that make their projects a success. If there’s one rule in business card design it’s let your personality show through. If that means getting rid of all the typical information on the front of a business card that so be it. Who said there were any rules in business and branding? James Bull (of “Moving Brands”) recently blogged, “5 Pointers For Starting Your Own Creative Agency”, and I (being pragmatic) was expecting advice that was a lot more practical. “Moving Brands” has been around for 18 years. They’re doing something right, but they may have forgotten the often overlooked realities of a creative start up. 1) Contract with a great accountant. As a creatively run start up; you’re often preoccupied with workflow, rather than cash flow. As you scale; you can’t underestimate the importance of bookkeeping and forecasting. The amount of stress trying to crunch 90 days of invoicing, accounts payable and taxes into a weekend isn’t healthy for you, nor your business. It may seem like an unnecessary expense in the beginning, but having a great accountant as part of your team will pay for themselves many times over in the long run. 2) Set very clear standards for your workflow process, and what qualifies as an excellent finished product at the project kickoff. This might surprise you, but the people that you are leading can’t read your mind. You will need to set extremely detailed expectations; as far as process, and final delivery. This isn’t about micromanaging, moreover; it’s about getting the client the best work possible without wasting time, or resources. 3) Splurge on the nice business cards. If you have to cut corners, cut them in ways that your clients, or potential clients don’t experience. Production value matters. Delivering a high quality experience through something as simple as a high end business card can go a long way. 4) Shed clients whom do not appreciate the company’s creative value. This is tricky because it’s always hard to say no to revenue. However, revenue isn’t everything. If you find yourself in a special relationships where your client has turned you into an order taker – (example: you’re churning out subpar work while you’re continuously working weekends in an attempt to meet an unrealistic deadline for something they’re most likely going to be disappointed with anyway) you may want to distance yourself from this type of relationship. When you do, you may find yourself in a better state of mind, and better yet doing the kind of work that led you to starting your own agency in the first place. 5) Always pick up the phone and say hello with a smile. Delivering great creative work matters, but in the long run healthy relationships matter more. If you’re a moody, loner creative, (like I was, and you’re starting your own business) get over yourself, and get ready to become an amazing account person as well. It’s probably the most important skill set you’ll need to master because creativity alone will only get you so far. Boutique marketing and design agency C2 Creative Consulting (Chicago, IL) seeks a creative and motivated entry level creative spirit with knowledge of design to support our team. This person will work closely with the Creative Directors, developers and other teams through all stages of creative development for a wide range of clients. Initial responsibilities will be 50% design and 50% administrative but will move to 100% over time based on performance. This position reports to the Creative Director. If you work with a client in the Pacific Rim, you’re at least 12 hours behind their workday. To catch up with their work flow, you need to prepare your team for regular after hours work or dedicate an existing team to servicing overseas clients. The ability to respond to client requests overnight and deliver solutions by the time they get into the office is a giant trust builder. There are numerous ways to connect with clients, so it’s important that you quickly establish a preferred method for real-time meetings so everyone knows where to login as well is frequently used links, passwords and meeting codes. We prefer Skype but Google Hangouts is another great option, although it might not prove as seamless for all clients. Remember, if you do use Skype download the app and use it on your phone too. Make sure you have your bank wire transfer information and process ready before the client requests it so you don’t lose time coordinating the details. While American holidays typically last a day or a weekend at most, New Year’s celebrations in Hong Kong run over a week. So it’s not highly unusual to lose contact with a client for a few days. Check your client’s country of residence calendar before assuming that something has gone horribly wrong. Collaborating with you may be your clients first venture into marketing in the US, and if there isn’t a language barrier, there will most likely be a gap between marketing nomenclature and overall marketing expertise. Take time to confirm strategy, deliverables, production specifications and creative direction. We typically share sketches with our clients and include them in our proposals to ensure everyone has a visual reference of the deliverables. Within a few months this will help create a common project vernacular. 在美國,你有可能與客戶初次嘗試市場營銷,如果沒有語言上的障礙, 則極有可能是市場營銷上的術語和整體營銷的專業知識之間的差距. 你需要花時間來確定謀略,交付,生產各種規格及創作方向.我們通常分享草稿給客戶, 其中包含他們在我們的建議中來確保每個人都有視覺上的傳達意境. 在短短幾個月內，這將有助於建立一個共同的項目方言. “This Is a Generic Brand Video” has been floating around for awhile and it’s a great stab at the formulaic advertising that gets produced all too often. This video was based on Kendra Eash’s satirical poem and produced by Dissolve. By contrast there’s been a rise in longer brand pieces that have been taken a very different approach. Here’s 3 of them. This is the companion film for Chipotle’s app-based game that was released last year. Creating branded content that people want to see and share while the RTBs take a back seat is never easy for a brand to do, but when it does a real opportunity for making a meaningful connection does.